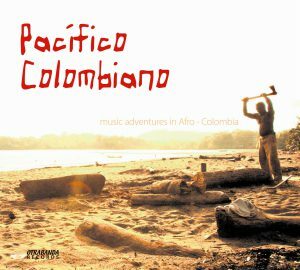 The Pacific coast of Colombia breathes the spirit of Africa – filled with the sounds of the African marimba, 6/8 rhythms, Afro-Colombian Fanfare, ancestral chants. This album offers a tantalizing glimpse at a cross-section of rural and urban music from older and younger generations from the cities of Buenaventura and Cali and the Chocó region with the marimba threading throughout the album like a musical snake. Colombia is a land blessed with a rich variation of musical tradition. Well known to the international world for its cumbia, vallenata and salsa from the Atlantic coast, the Pacific coast has remained a well kept secret until now. In the past decade in Colombia itself Pacific music has made significant inroads into the national music culture as a new generation of musicians and producers carry on the traditions of pioneering musicians. These are all featured on Pacifico Colombiano. Otrabanda (music from the other side of here and now and then) Records is proud to introduce this fantastic music to an international (world) music audience. This album offers a tantalizing glimpse at a cross-section of rural and urban music from older and younger generations from the cities of Buenaventura and Cali and the Chocó region with the marimba threading throughout the album like a musical snake. The tracks on the record were all taken from local productions on the Pacific coast between 1998 and 2008 and aptly illustrate the growth and development of its recording industry and characteristic Pacific sounds of currulao, marimba and chirimia (the Afro-Colombian fanfare). 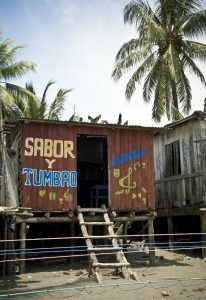 The Pacific coast of Colombia breathes the spirit of Africa – filled with the sounds of the African marimba, 6/8 rhythms, Afro-Colombian Fanfare, ancestral chants. The first African to arrive on the Pacific coast was not short on ingenuity: he made his marimba from hardwood palm timber; achira seeds were used to fill the guazás (the Pacific maraca). 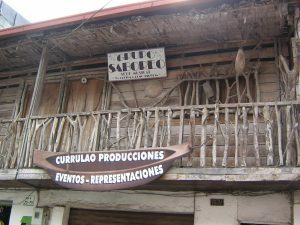 The wood was then used to create the drum family: bombos or tambora drums (for striking and singing) and cununo drums ( ‘male’ cununo, largest version of this drum, for rhythmic variations, and the ‘female’ cununo, the smaller version for marking the beat, higher in tone), with cow or goat hide drumheads. The natural environment provided everything needed to create an orchestra and an African symphony, right in the middle of the Colombian rain forest. The authentic Afro-Colombian Fanfare Band – with clarinets, the euphonium, brass pans, snare drums, tambora or large bombo bass drums – this, too, came together in the Department of Chocó. The artists featured range from the traditional sounds of marimba, cununo drums and vocals by Grupo Socavon and Naidy, to the hip-hop crew Choc Quib Town, the self-proclaimed purveyors of the new folklore for the younger generation, the urbane hip renditions of Liliana Montes and La Revuelta with their jazzy inflections, the “voice” of the Pacific region Markitos who also sang in the legendary King of Currulao group Peregoyo, folk music kings Pacho Peña y su Chirimia, the legendary vocalist and composer Alfonso “El Brujo” Cordoba, the impudent, rollicking chirimia masters of humorous song La Contundencia and the swinging electric currulao pioneers Grupo Saboreoand Grupo Bahia. Amsterdam-based F.P. Barrio Nuevo blends the Colombian Pacific sound with elements of the Dutch Caribbean, offering a new hybrid for the future.